First timer here attending the Philippine Hot Air Balloon Fiesta 2016. The experience was both positive and negative at the same time. But all in all, it was worth a try. To begin, I've read about this yearly festival several times already but never bothered to attend. 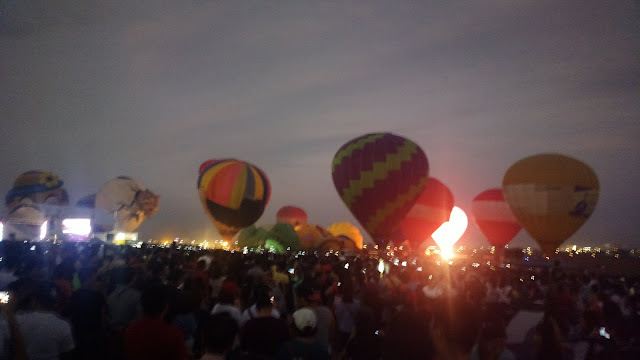 But while waiting for the recently concluded PBA cup's tickets to become available at TicketNet (well, I never got to buy good seats anyway so I didn't book any :), I browsed through other events and saw the page for the Philippine Hot Air Balloon Fiesta. We immediately booked tickets for the family. Come February 14, the last day of the event and incidentally Valentine's Day, we left before 5AM but got stuck along Candaba viaduct for over 30 minutes due to multiple car collisions involving more than 10 vehicles below the bridge. From there after, traffic was still present and got the heaviest once we reach Clark's premises after getting lost for a few minutes while following Waze's directions. I'm still getting used to this app and become confused sometimes. I realized that it's best to conduct multiple searches first using variations of the destination address before settling for one specific route. We parked at a gas station that's supposedly just two stoplights away from the venue. We walked like many others did. Those stoplights turned out too far and we ended up walking more than 3 kilometers! The taho vendor wasn't joking when he said we may end up walking for an hour! We transferred the car closer in order to not walk that much again after the event. But the file of people waiting for a jeep going back to the city proper is long. You better walk away from the loading area and board the jeepney away from the flock of folks. Parking was solved for only 50 pesos flat. Literally, it's dust till dawn. Automobiles show evidence on this as well as my feet after walking. I had to splash my soles with water once we got comfy seated on the food court area inside the port. Bad idea wearing open sandals. I wished I wore closed shoes instead along with long sleeves made of thin fabric to ward dust and sunlight too. Good thing I wore leggings and the sunscreen lotion helped. Kid's playing mats were also heaven set. There were stores which sold them for those who forgot to bring any. Tents were also a-plenty. Others just used newspapers and their own clothes or bags. Thank God for the old fighter plane jets parked outside the barricaded hangar! They provided shade to cover us quick after hours of seating and buying random food just so we won't feel embarrassed while seated too long on the food court area. An umbrella is also handy but we didn't bring any. Good thing National Bookstore gave a free umbrella with a 200 pesos worth of purchase from their stall. Other than NBS, there were numerous food stalls as well as souvenir shops to buy items from too. I probably spent more time checking the booths and observing people than watching the actual program proper. Most of the attendees comprised of families, barkadas, and dating couples. Hey, there were kids on costume too! I saw one with a Star Wars Stormtrooper outfit but I forgot to take a snapshot. Other than the free umbrella, there were other freebies including a sample of Kopiko 78°C Coffee Latte. We also brought home items from Manila Bulletin after participating in their dart game. There were two attempts for each player and we all got our freebies after one attempt alone. Wohoo! There were numerous shows and exhibitions included in the whole day's program but we didn't notice them much because it was too hot to watch near the mock stage and the open area overheard where exhibitions were held. We did see some shows late in the afternoon when it was no longer humid. Some of which included paragliding and light aircraft flights. The main event was what everyone waited for (I assume). The balloons were inflated and lit to display a night glow, literally. It was too short though. Bitin. Live bands played while the balloons were inflated and when they were glowing. Slapshock was scheduled to perform during the free concert at night but we didn't stay late enough for that anymore. We didn't see the supposed fireworks display too. If you plan to watch next year, better prepare. Visit the official website of Philippine Hot Air Balloon Fiesta 2016 at www.philballoonfest.net.